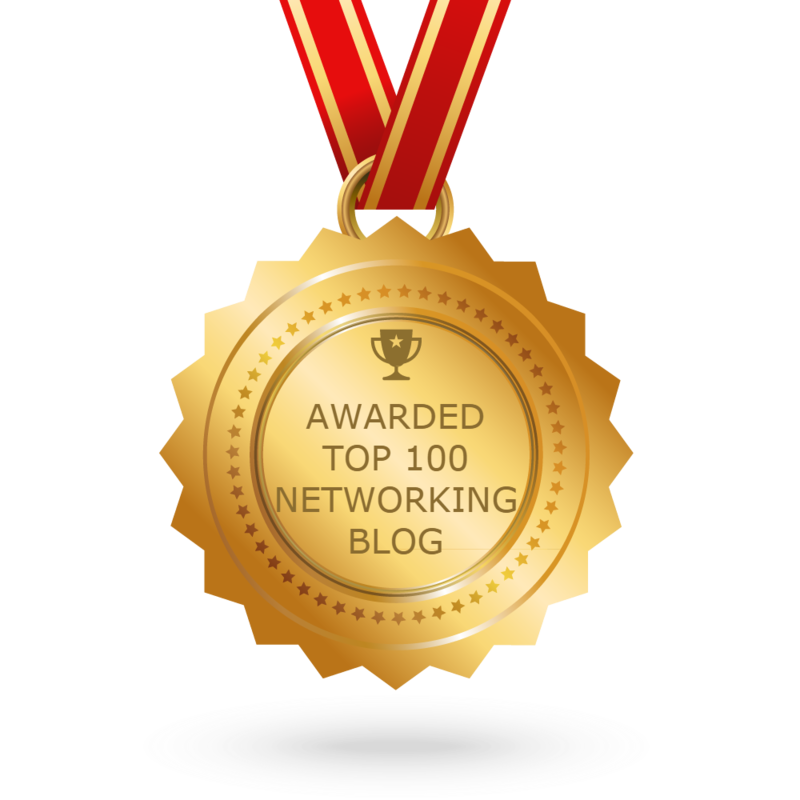 You are here: Home 2014 May How to Start a Cisco Catalyst 1900 Series Ethernet Switch? How to Start a Cisco Catalyst 1900 Series Ethernet Switch? Although some popular Cisco models are End of Sale and have been announced EoL, some Cisco users are stilling choosing them to set up networks for their offices, such as Cisco 1800 router, Cisco catalyst 1900, Cisco 2950 switch, Cisco router 2800, etc. It’s hard to find this kind of Cisco hardware in the hardware market after reaching the end of life. (Most of them are second hand or refurbished.) There are some common problems that they may encounter. In this article, we will share a simple guide of starting a Cisco 1900 Ethernet switch, also some tips and notes. Okay, now we will start the Cisco catalyst 1900 hardware in more details. If any item is missing or damaged, contact your Cisco supplier or reseller for support. Note: You need to supply Category 3, 4, or 5 straight-through or crossover cables to connect to Ethernet devices. Note: Use a straight-through cable to connect two ports when one of the port numbers is designated with an X. 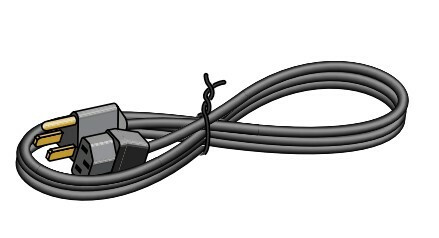 Use a crossover cable to connect two ports when both port numbers are designated with an X. These cables are not supplied. 1. 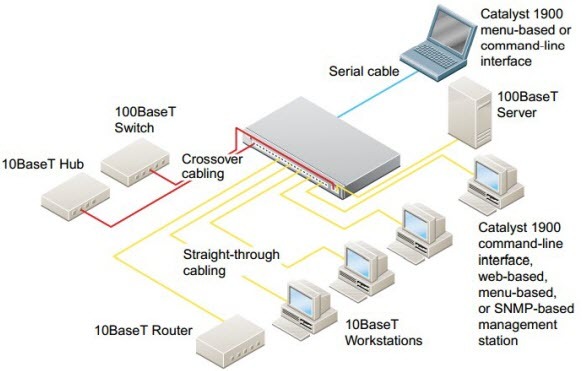 Connect a Category 3, 4, or 5 straight-through cables to a 10BaseT port on the switch and to a 10BaseT port on the workstation, server, or router. 2. Connect a Category 5 straight-through cable to a 100BaseTX port on the switch and to a 100BaseTX port on the workstation, server, or router. 1. Connect Category 3, 4, or 5 crossover cables between 10BaseT ports on the switch and on the target switch or hub. 2. Connect Category 5 crossover cables between 100BaseTX ports on the switch and on the target switch or hub. 3. 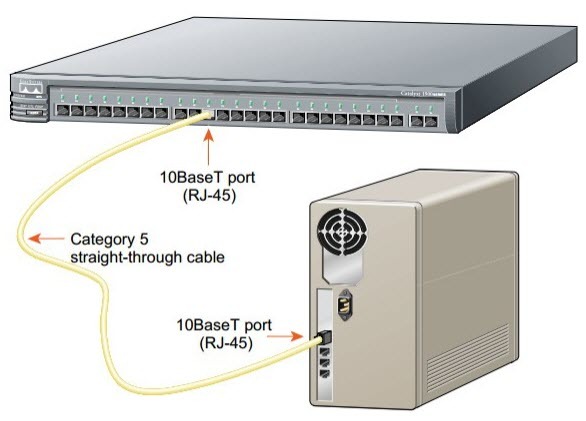 For models with one 100BaseFX port, connect a 50/125- or 62.5/125-micron multimode fiber-optic cable between the 100BaseFX ports on the switch and on the workstation, server, target switch, router, or hub. 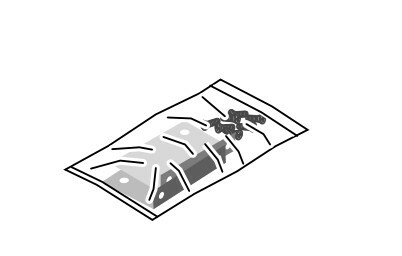 For models with two fiber-optic ports, use MT-RJ fiber-optic patch cables ordered from your cable vendor or from Cisco. 1. Before connecting to a terminal, PC, or laptop, make sure its settings match those of the console port on the switch. The default settings of the console port are 9600 baud, 8 data bits, 1 stop bit, no parity, and no flow control. 2. 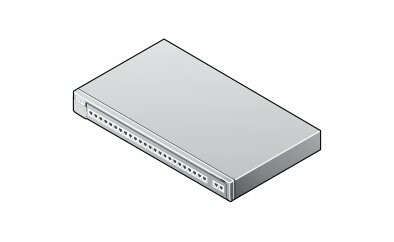 Connect the supplied rollover cable to the console port on the switch. 3. 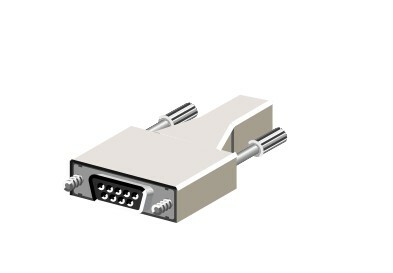 Connect the other end of the console cable to a terminal, PC, or laptop running terminal emulation software (such as ProComm or HyperTerminal) by using an RJ-45 to DB-9 adapter (supplied) or, if necessary, an RJ-45 to DB-25 adapter (not supplied). 4. From your terminal or PC, start the terminal emulation program. 1. Connect one end of the power cord to the switch and the other end to an AC power outlet. 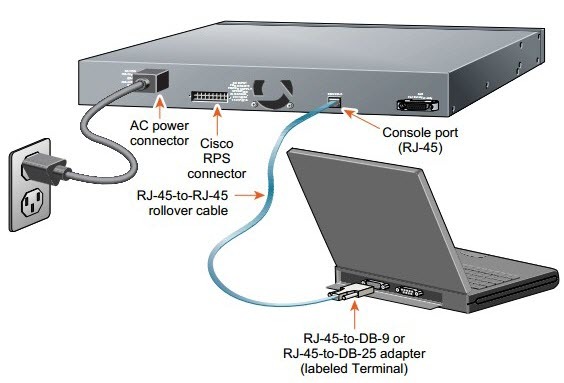 Note: If you are connecting to a Cisco 600W AC redundant power system (RPS), refer to the Catalyst 1900 Series Installation and Configuration Guide and the latest RPS documentation for more information. 2. Wait approximately 2 minutes for the switch to complete its power-on self-test (POST) and to discover the network. You assign an IP address to the switch so that you can use the switch management interfaces and so that the switch can communicate with local routers and the Internet. Assigning a password provides security against unauthorized access to the options available from the management interfaces and is required for using the Catalyst 1900 Switch Manager. Note: If the switch will be a cluster member, it is not always necessary to assign IP information or a password, as the switch will be accessed and managed through the password and IP address of the command switch. Refer to the Catalyst 1900 Series Installation and Configuration Guide for more information. Contact your system administrator for the switch IP information, and record it here. 1. After POST completes, the Management Console Logon Screen appears on your terminal, PC, or laptop. Enter the [I] IP Configuration option from this logon screen. The IP Configuration Menu appears. 2. Enter the [I] IP address option from the IP Configuration Menu. If the switch does not have an IP address, the Current setting appears as 0.0.0.0, and you can enter the IP address of the switch as the New setting. If the switch is connected to a network that has a Dynamic Host Configuration Protocol (DHCP)/Bootstrap Protocol (BOOTP) server, the server might automatically assign an IP address. 4. If you plan to assign a subnet mask and default gateway, use the [S] Subnet mask and [G] Default gateway options from the IP Configuration Menu. 1. From the IP Configuration Menu, enter the [X] Exit option to again display the Management Console Logon Screen. 2. Enter the [P] Console Password option from this screen. Enter a 4- to 8-character password, and verify as prompted. This password is an unencrypted privileged password that controls switch access. 3. Press any key to return to the Management Console Logon Screen. The switch is designed to operate with little or no user intervention. In most cases, you can use it with its default settings as soon as you assign it an IP address and password. To change the switch configuration and to monitor network conditions and statistics, you can use the management console menus or use the web-based Catalyst 1900 Switch Manager from anywhere on your intranet. If the switch is running the Cisco Catalyst 1900/2820 Enterprise Edition Software, you can also use the command-line interface (CLI). 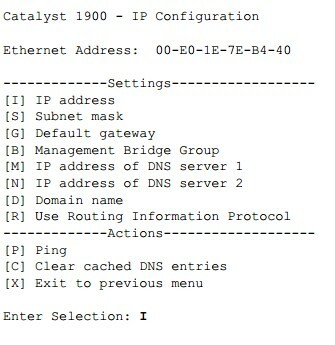 The following section describes how to access the Catalyst 1900 Switch Manager home page. 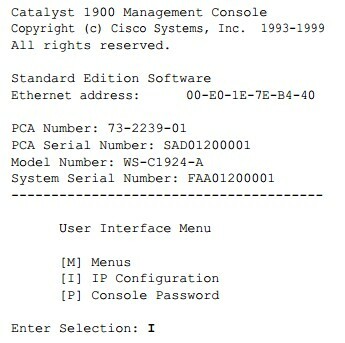 For information about using the management console menus or the Catalyst 1900 Switch Manager, refer to the Catalyst 1900 Series Installation and Configuration Guide. For information about the CLI, refer to the on-line Catalyst 1900 Series and Catalyst 2820 Series Command Reference. Note: Netscape Communicator version 4.60 is not supported. 1. From the menu bar, select Edit>Preferences. 2. In the Preferences window, click Advanced. 4. From the Advanced drop-down list, click Cache. 5. Click the Every time radio button. Note: For procedures on how to configure Microsoft Internet Explorer 5.0, refer to the Catalyst 1900 Series Installation and Configuration Guide. 1. From the menu bar, select View>Internet Options. 2. In the Internet Options window, select the Advanced tab. 3. Scroll through the list of options to Java VM, select the Java JIT compiler enabled and Java logging enabled check boxes. Click Apply. 4. In the Internet Options window, select the General tab. 5. In the Temporary Internet Files section, click Settings. 6. In the Settings window, click the Every visit to the page radio button, and click OK.
7. In the Internet Options window, select the Security tab. 8. In the Zone drop-down list, select Trusted Sites Zone, and click Custom. 10. In the Security Settings window, scroll to the Java>Java permissions section, and select the Custom radio button. 11. Click Java Custom Settings…, which appears at the bottom of the window. 12. In the Trusted Sites Zone window, select the Edit Permissions tab. 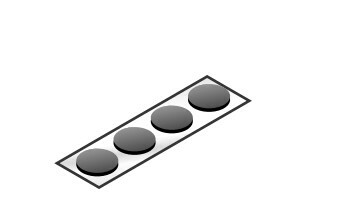 (a) If the buttons under Run Unsigned Content are not available, return to the Security Settings window, and select either Medium or Low safety in theReset Java Permissions list box. Click Reset. (b) Under Run Unsigned Content, select the Enable radio button, and click OK.
13. In the Security Settings window, click OK.
14. In the Internet Options window, select the Security tab, and verify that the Zone drop-down list is set to Trusted Sites Zone. 15. In the Trusted Sites Zone section, click Add Sites…. 16. In the Trusted Sites Zone window, deselect the Require server verification check box. 17. In the Add this Web site to the Zone field, enter the IP address of the switch. Note: If the switch will be a member of a cluster, you only need to enter the address of the cluster command switch. Refer to the documentation for the cluster command switch for more information. 18. Click Add, and then click OK.
19. In the Internet Options window, click OK.
1. Enter the IP address of the switch in the Location field if you are using Netscape Communicator (the Address field if you are using Microsoft Internet Explorer), and press Return. 2. Enter the switch password assigned through the console menu. At the prompt, click OK. The Catalyst 1900 Switch Manager home page is displayed. You can use the Switch Manager to change the switch configuration and to monitor switch conditions and statistics from anywhere on your intranet. 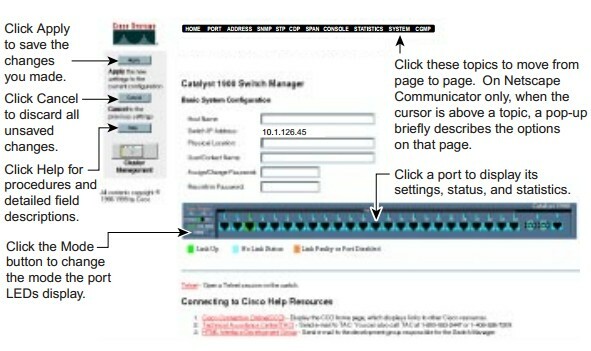 Configuring the Cisco Catalyst 1900 switch: https://www.techrepublic.com/article/configuring-the-cisco-catalyst-1900-switch/#.